• View topic - Should the piano be played in Stereo or Mono? Should the piano be played in Stereo or Mono? At our organ club earlier this month we had a local lad (well, he was in his early 30s) come and play piano. This is unusual for us, as we usually have one of the professionals playing, and they bring their own organ, or keyboard with pedals .. and have a couple of loudspeakers up on poles. But I had heard this lad playing a couple of times before, on a Grand Piano. He does all the arrangements for our Operatic Society, and plays for whatever Pantomime we have over Christmas. He also playes at a couple of music schools in London. And I thought he was absolutely brilliant! So I put the word about the club that although we didn't have a professional coming, we never-the-less had a superb pianist on the agenda. I asked the organiser how they were going to get a Grand Piano up on the stage in the Football Club where we held our meetings, and she said they couldn't do that .. but that he would bring his own equipment. Which he did, a keyboard with a Sustain Pedal. Just the ticket, and a lovely sounding keyboard piano. But .. (you knew there was a 'but' coming, didn't you?) ..
.. he had one single speaker (about 1' 6" across) and had it connected to his keyboard via a Mono output. I reckon, as all his playing came from straight in front of us from the one speaker, with high notes and low notes all mixed up and indefinable from each other. A very 'hollow' sound, and not a happy experience! And then I thought, of course, every time I have heard him play he has played a 'real' piano. Whether a Grand or an Upright, the longer strings for the bass notes are to the left, the hammers for the middle notes come from the centre, and the high notes come from the shorter strings on the right. In other words, when listening to a real piano you are sort of listening 'in stereo'. So why didn't he take a stereo output from his keyboard? There are several schools of thought on this, which are explained in the YouTube videos that follow. First, lets take a look at how a 'real' piano might be recorded to get a stereo recording. Of course to record a 'real' piano you need mikes, and these are positioned in this video roughly where your ears are, as that is where you 'hear' the piano you are playing. The video is definitely in stereo, and you can hear left and right predominance when he speaks (and at one point he clicks his fingers too). When he plays the piano, the sound is as your ears would hear it, and notes are not particularly 'panned' to the left or the right. 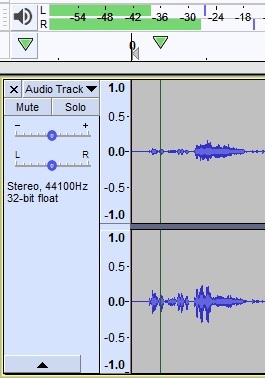 And the piano sound is in stereo, as indicated by the waveform I have put underneath. Here is the recording of the piano bit he played .. as MP3. .. and below is the waveform of the piano being played. Clearly in stereo as indicated by the green volume bars, and by comparing the left and right channels of the waveform. Hi Hugh the player in this clip talks about the michrophones but no mention of the type of speakers he is using. Surely they are important? Best Regards mikeG. Re: Should the piano be played in Stereo or Mono? The speaker setup you have is always important (and the type of speakers). Most professionals who come to play at our organ club put their speakers on top of poles, but some just put them on the floor of the stage. Of course in this clip he is playing a 'real' piano so the microphones are picking up a real 'live' sound and he won't be using any speakers. It is us listening to his recording that will give the 'fullness' or otherwise of his recording. I am wearing Sennheiser headphones to listen so the piano sounds pretty good. In my next few posts I have several 'keyboard' piano demonstrations. In the second one he is using speakers (as he isn't wearing any headphones). Not sure this has come out as he intended! Here is a Piano Demonstration where first he plays a piano piece (and records it, directly from the keyboard .. no mikes!) in MONO; and then does the same, but in STEREO. I am wearing headphones, and the difference (to me) is very marked. The Stereo recording is so much 'fuller', and sounds more like a real piano (when you are sat playing it) with bass notes to the left, middle notes in the middle, and high notes to the right. A much 'fuller' sound. This Demo has been played on a Korg. Next, we have another Demo where the presenter says that in a 'band' situation, where there are other instruments (and maybe even a singer) the piano should be done in Mono. This is because with a 'Stereo Piano' the sound from the speakers on either side can interfere with each other; and also, the piano coming from left and right can make it difficult to pick out the other instruments in the mix. Listen carefully to what he says, and what his 'Stereo' and 'Mono' pianos sound like. He is obviously quite taken with the sound of his piano 'in Stereo', and would have that if just playing by himself. But he would switch it to Mono if playing with others. But I have noticed that he is using a mike to do the diction; and is not wearing any headphones. Which means that the recording we are listening to is not 'wholly' digital, as the mike he is speaking into is also picking up the piano from the speakers of his keyboard. So I am not convinced that we are hearing the same as what he is hearing .. from the speakers of his keyboard. I have picked out the section where he actually 'plays' his piano in STEREO, and follows by playing his piano in MONO .. then STEREO again. Sorry, but I can't hear the difference between his 'stereo' sound and his 'mono' sound .. and I am wearing headphones. 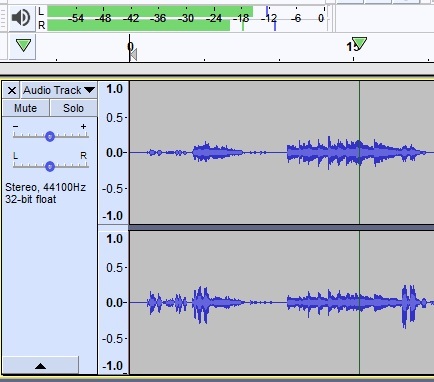 Here is the waveform of him speaking (this also shows the green bars for the volumes of the left and right channels). Clearly this is in Stereo. Now for the first STEREO part of his recording. Again, from the green bars, this is STEREO. 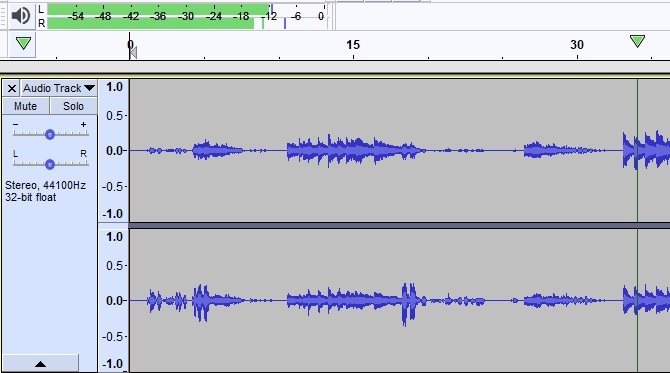 Now for the second bit of his recording, the MONO part. Looking at the green bars, and listening to what he has played .. this bit of the recording is in STEREO too! No matter, I do understand the point he is trying to make, which is a lot clearer in the next YouTube video I am posting. Here is another YouTube video which clearly shows how in a 'band' situation (with a singer) it is preferable to have the piano playing in MONO .. and PAN it (in this case to the right). This positions the piano to one side of the stage and the mind can concentrate on the main singer. The piano just becomes another 'instrument' in the band. In this video I show how sometimes the best piano sound isn't the big wide stereo one. Sometimes in order to place your piano well in the mix (and make room for all the other stuff) you need to pan the darn thing mono! The Piano on my AR organ is not in Stereo. But I can 'pan' it to left, centre or right. If I have piano as a PART in a STYLE I would always 'pan' that to one side (usually the right) so the other instruments in the mix are more easily picked out. I will finish this topic with a sound demo (in Stereo) by freelance keyboardist Jonas Gröning, showing some useful live sounds from the new Yamaha CP88 stage piano. Notice how at 1.26 the electronic piano sound is alternating between left and right with 'Auto Pan'.